Do the humpty hump dance for hump day! Inching closer and closer to the weekend! I am looking forward to the weekend because I get to hang with some good friends that I haven’t seen in a minute. I will also be working on new content for the blog, which is one of my favorite pass times. I love styling looks and finding new and great places to shoot photos. Although I do feel camera shy most of the time, I love getting the photos home, editing them, and seeing what magic I can create. Plus every time I get out there, I get to practice overcoming my fear of people’s staring eyes. I know it’s really all in my head, so I am working really hard to overcome it. Any fellow bloggers or friends with me on this? Maybe not even when it comes to taking photos? Anyhow, as we all know, spring is rapidly approaching! Spring is probably my favorite season…well, who am I kidding? I love them all! The one thing that sways me for spring is all of the beautiful flowers. I am a sucker for flowers or floral anything! Side note: I cannot wait to head to see the flower fields in March!!! Who’s going? Spring means pretty dresses and pretty floral dresses make spring even better! Look at this stunner above! I love it! 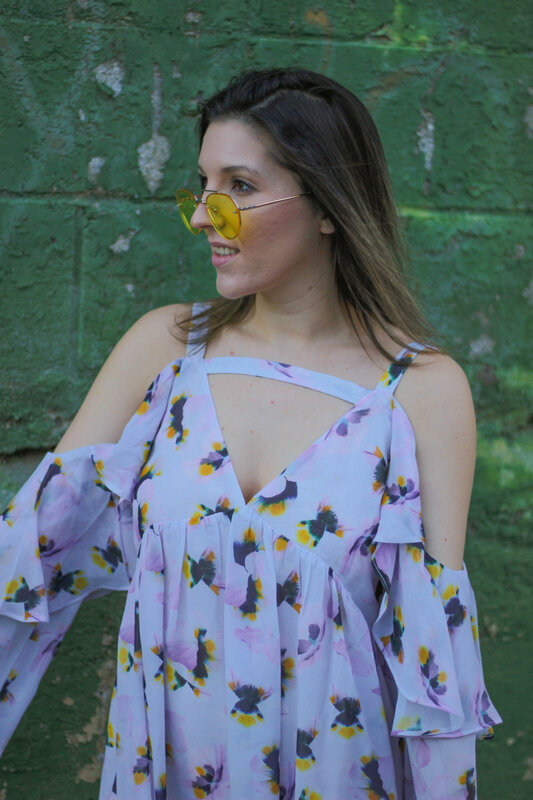 It’s got all the right details: ruffles, cold shoulder, cut out detailing, and a beautiful floral print. Swoon goes my heart! I really wanted to capture the essence of a floral spring for this photo, so I added some fun and bright yellow sunglasses and shoes to keep the mood fresh and lively, like spring is for me! I also pulled out my favorite bag, a Cult Gaia classic that goes with everything, but works surprisingly well as a makeshift flower vase! I don’t know about you but this photo series has me craving spring and flowers. Here in LA, we are getting a bought of rain, so as the saying goes… we should get plenty of flowers this spring. Eek! Can’t wait! What do you like to wear for spring? And what is your favorite season? Comment below or on my photo on instagram!